Measuring only 33″ across, this hanging Chevron Credit Cards Round Porcelain Sign is vibrant with its blue and red color contrasting with the white detail. The sign hangs from above. 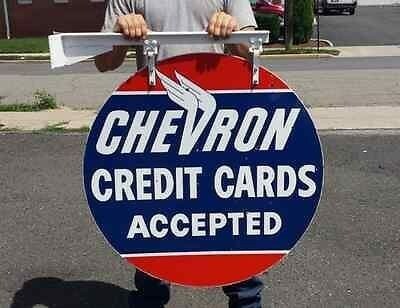 The text on this sign reads “Chevron Credit Cards Accepted. The “V” in “Chevron” has wings the go off to the upper left.